This is my "Macross: Do You Remember Love?" 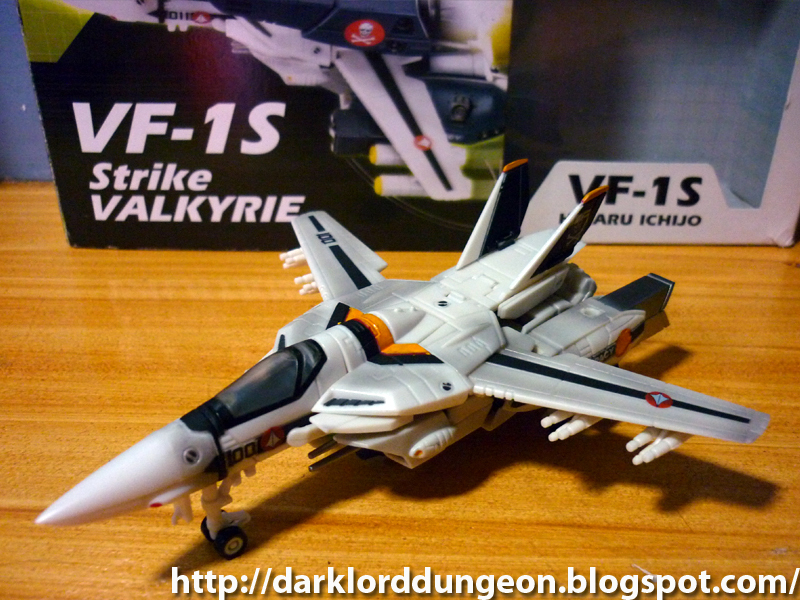 1/100 Variable VF-1S Strike Valkyrie Fighter produced by Harmony Gold and Toynami. This is from the Japanese version of the cartoon, not from the American "Robotech" version, although without the box, and unless you're familiar with the sticker differences between the two, there really isn't any way of telling. 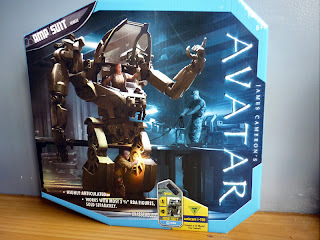 I purchased this from Maxicollector in Fort Bonifacio for PhP 1495. Manufactured by Stonewell/Bellcom a VF-1S Strike Valkyrie is a variant of the VF-1A reserved for Squadron Commanders that differs from the standard VF-1A only through the number of ROV-20 lasers mounted on the sensor pod (head): 4 versus the VF-1A's 1 and in their powerplant - the VF-1A has a Shinnakasu Heavy Industry/P&W/Roice FF-2001 Thermonuclear reaction turbine engine versus the VF-1S's D variant of the engine (We'll talk about the Strike part later). It is an unfortunate reality that eventually you wake up and realize that you're out of display space for new toys. So even if it's sad, you have to choose which toys get taken down, cleaned, sealed in plastic sandwich bags and put into storage till the day comes when you win the lotto and have a museum to display them all. Toys R Us has opened four more branches--Greenbelt 5, Glorietta 4, Shangri-La Plaza, and Power Plant Mall. Now you have more reasons to shop for toys. The Dungeon received a request last week to compare the Avatar AMP Suit against the G.I. 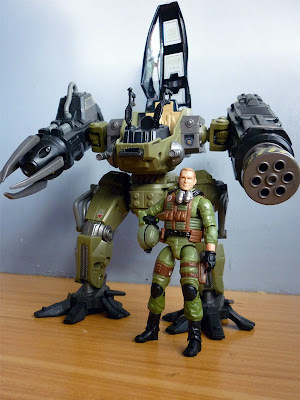 Joe Steel Marauder, so here it is. 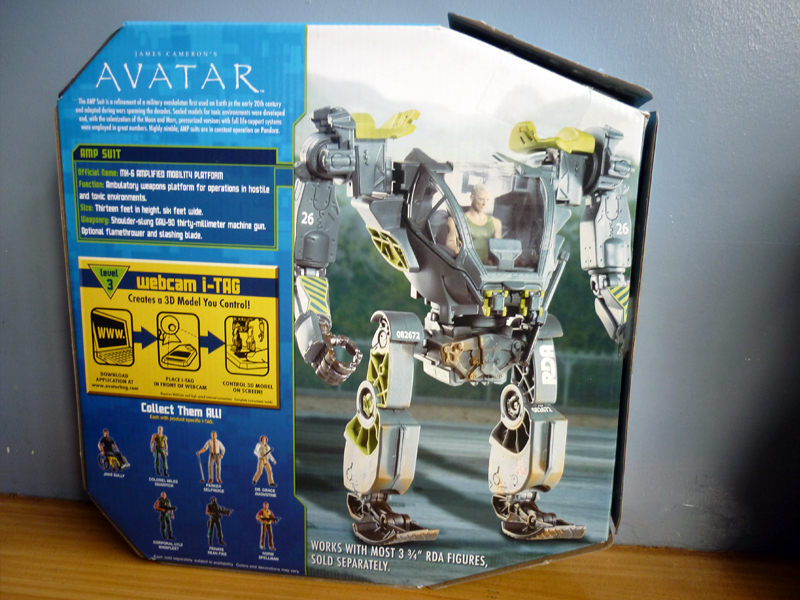 First the bad news, the Avatar AMP Suit in my possession is a variant of the one more commonly found in the market or on E-bay. This particular variant does not bear the shoulder-slung GAU-90 30 mm machine gun. Instead it bears an optional slashing blade - as seen in the film. So if you see this particular packaging and want the AMP suit with its machine gun, don't buy this.The package describes the AMP suit as a"Refinement of a military exeskeleton first used on Earth in the early 20th century and aapted during wars spanning the decades. Sealed models for toxic environments were developed and, with the colonozation of the Moon and Mars, pressurized versions with full life-support systems were employed in great numbers. Highly nimble, AMP suits are in constant operation on Pandora"
The G.I. 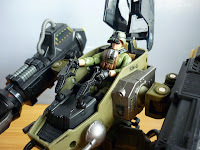 Joe Steel Marauder Mobile Mech Suit has yet to be released here in the Philippines through retail outlets. 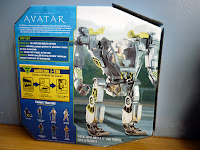 You'll have to find one in Greenhills or in ebay - where I got this particular model (Check out Jedimarc76 as he still may not have moved the Cobra Deviant Mech yet if you're interested). The Marauder comes with Sergeant Joseph "Kickstart" Rivera, a plethora of stickers to attach and six missiles that can be launched from the Marauder's left arm - however it looks better without the missiles, so I removed them. To see the missles, check out my video review. 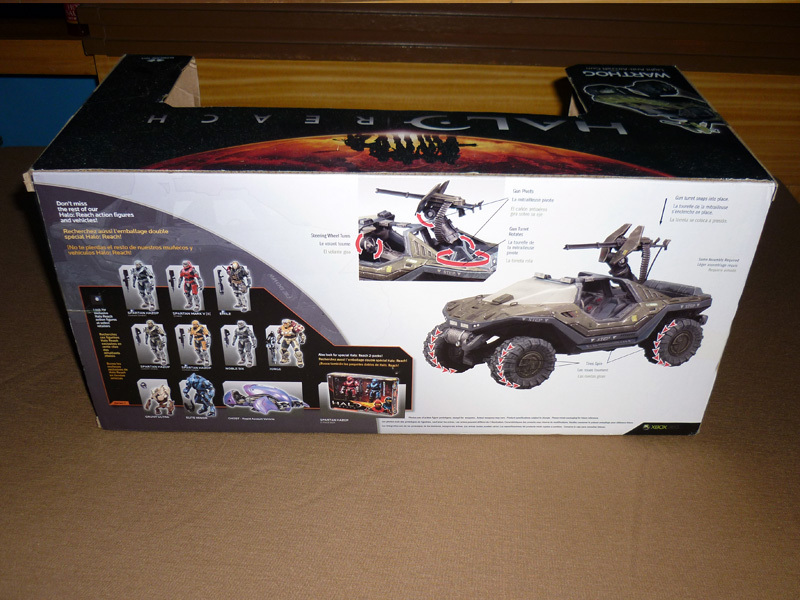 The box describes the Marauder as a "Suit that boosts strength and speed to tremendous levels! This highly advance battle armor gives the G.I. Joe Team powerful support and firepower in the battle against Cobra!" Note that Kickstart sits in a cockpit and operates joysticks and therefore lends none of his strength to the performance of the Marauder. This is therefore not a suit. It's clearly Mechanized Armor, a Mech. 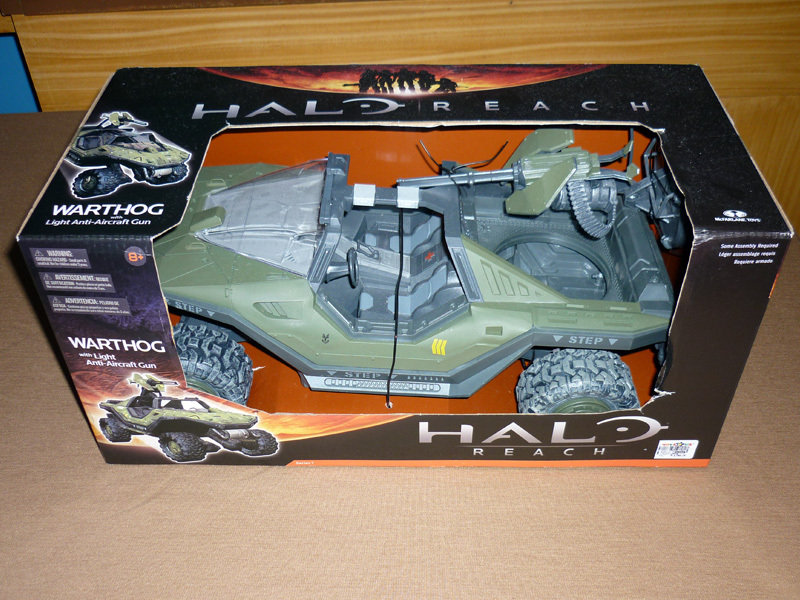 From the game Halo: Reach, and technically all other Halo games before that, the fighting workhorse of the UNSC, the M12 Light Reconnaissance Vehicle, AKA the Warthog. Known Aliases: Guardian, "Ka Achilles"
Founded Dark Lord Dungeon (His initials) with the simple objective of sharing with the Dungeon's visitors the same joy he gets from toy collecting - and because he needed a venue where he could sharpen his writing skills. He still dreams of one day travelling to the stars to lead the Light Brigade against the Clan invasion astride Aura Deva, his Cerberus Assault Class Battlemech. Till then he serves as a freelance magazine publisher in the real world. Hi, Lanz Frago here. I mainly collect Revoltechs, Nendroids, Figmas and Gundams. 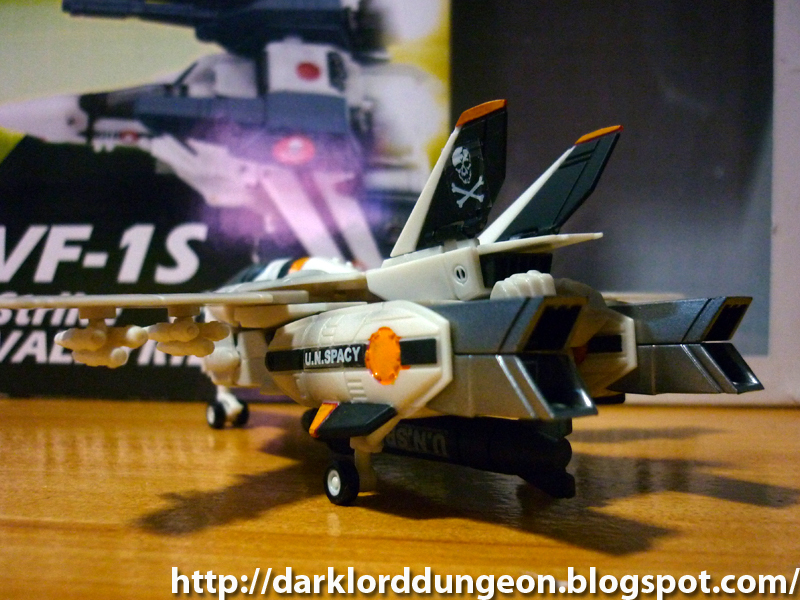 Picky about paint jobs and articulation points on toys. I'm also into comic books, video games, Batman, cartoons and digital art. Do join her in her Happy Hospital. 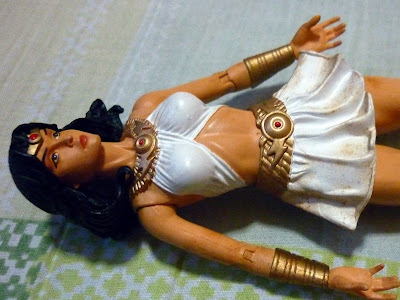 Do you have press releases about toys, games, and other related topics? Do you want to invite me to events? Do you have a proposal for a business arrangement? 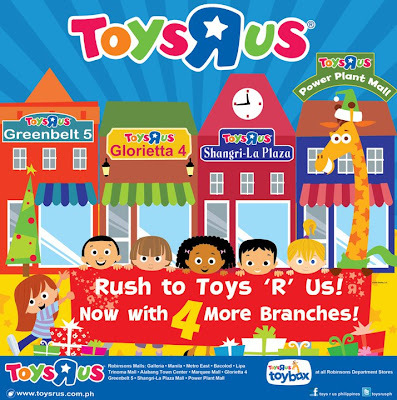 Toykingdom actually has a website www.toykingdom.ph but it's horribly out of date. Had I not passed through EDSA yesterday, I would not have seen a sign announcing a Warehouse sale with as much as 70% off of regular prices on November 5 to 7, 2010, at the 5th Floor of SM Megamall, Megatrade Halls 1 & 2. Quite frankly, TK's warehouse sales tend to be very hit and miss. Sometimes you run into a treasure trove, sometimes you're bored out of your mind, but why take the chance? Go check it out. The first day, November 5 is unfortunately only for TK card members - and I think SM advantage card members (I'd tell you which, but their site doesn't even bother to announce it). So just to be safe, hop on over on the weekend. 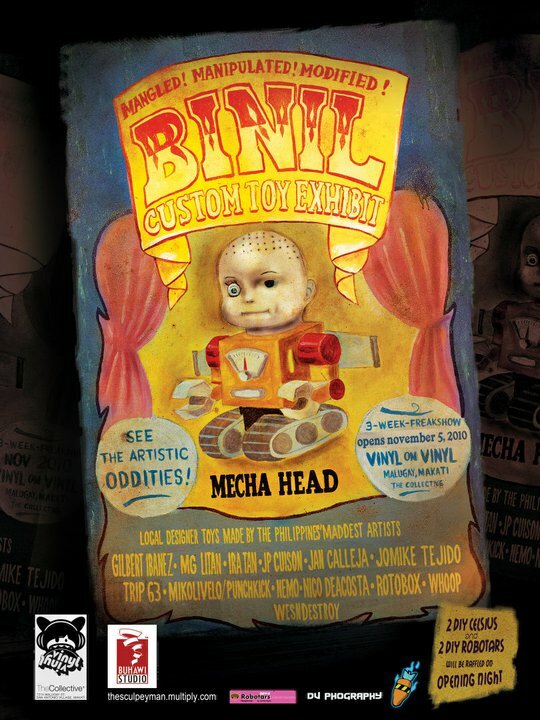 An old high-school friend of mine: Jan Calleja is part of a custom toy exhibit that opens on the 5th of November in 7274 Malugay st. San Antonio Village, Makati City. "Binil" is an exhibition of the latest custom Vinyl toys, prints and paintings of artists: Alex Mrtinez, Rotobox Vinyl Anatomica, JP Cuison, Jan Calleja, Gilbert Ibanez, Ira Tan, Nemo, MG Litan, Nico Deacosta, Miko Livelo, Jomike Tejido, Whoop and Wesndestroy. Presenting elements of the UNSC Special Warfare Command Group Three (AKA Noble Team): (L-R) Warrant Officer Emile-A239 (Noble Four), Lieutenant SPARTAN-B312 (Noble Six), and the big-boy Chief warrant Officer Jorge-052 (Noble Five). 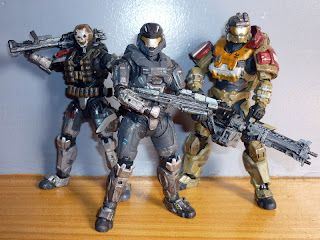 Spoiler: By the end of the video game, Halo:Reach, all three are dead - including, well... you since you'll be playing Noble Six.